Font setup, especially for CJK (Chinese-Japanese-Korean) fonts, is complicated, mostly due to a diversity of formats, diversity of configuration places, and last but not least the inflexibility of Ghostscript. 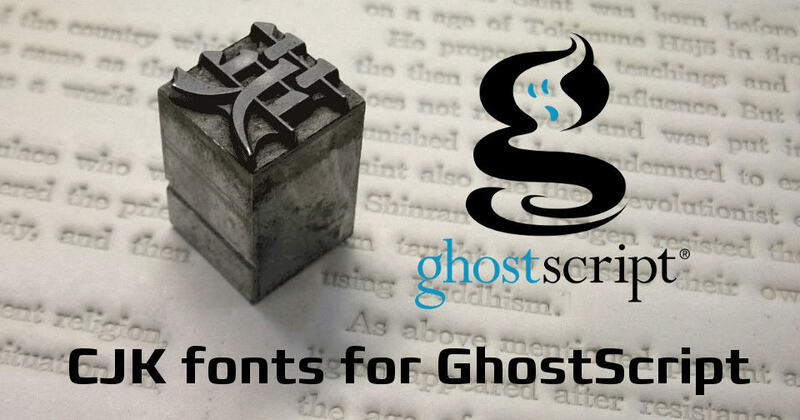 The script we are developing aims at a one-shot solution that searches all available fonts, and makes those recognized available in Ghostscript. The script is available from CTAN and also from TeX Live, package name cjk-gs-integrate. The script and some test files are developed in the Github cjk-gs-support repository. Currently nothing more than the script itself is needed, as the font database is included in the script. This script searches a list of directories (see below) for CJK fonts, and makes them available to an installed Ghostscript. In the simplest case with sufficient privileges, a run without arguments should effect in a complete setup of Ghostscript. Finally, the script adds code to GhostScript’s Resource/Init/cidfmap to load the generated cidfmap.local and cidfmap.aliases. Warning: When run on a Unix system without adjusted output option, the script normally requires root privileges, as it tries to write to the Resource directory of an installed Ghostscript. Without any further customization via command line options, the script tries to set up a Ghostscript searched via the gs program in the path for all fonts found. This options change the behavior in the sense that nothing is actually set up, but information about found fonts and alias ordering is output. The above invocation will result in fonts found in the above two given directories to be searched in addition. If no output option is given, the program searches for a Ghostscript interpreter gs and determines its Resource directory. This might fail, in which case one need to pass the output directory manually. Since the program adds files and link to this directory, sufficient permissions are necessary. That is, the first font found in this order will be used to provide the alias if necessary. The format of the font database is as follows: Entries are defined by paragraphs, that is, they are separated by one or more empty lines. Each entry needs a line specifying the name (in particular the PSName), the type, the class, a list of possible file names, and a list of provides. Provides – A free-form name of a font to be provided. This will generate an alias entry unless the provided font is actually available as real font. Provides can have a priority in case several fonts provide the same alias. The priority is written in parenthesis between the Provide and the : (optional). Priorities are the lower the better. Filename – A possible filename that provides the font. These file names are searched on the system. As with the provides, filenames can have an attached priority to select from multiple version of font names. The current font database is contained in the script at the very end. But users who want to experiment can save the database to an external file, make changes to ones liking, and run the script with the -f or --fontdef option to provide an alternative font definition. If you find a missing font or missing/wrong information, please inform the me via a github issue or email. Thanks. The script and its documentation was written by Norbert Preining, based on research and work by Yusuke Kuroki, Bruno Voisin, Munehiro Yamamoto and the TeX Q&A wiki page. Big thanks goes to all those three and many more for their excellent work. The script is licensed under GNU General Public License Version 3 or later. The contained font data is not copyrightable. I will not go into details of font formats, there are thousands of pages out there doing this. I only want to list the font formats with which we are concerned, namely Open Type fonts. Due to their history, these fonts come in two different variations. The more standard TTF form, containing TrueType outlines using quadratic Bézier curves. And the OTF/CFF form, containing CFF outlines using cubic Bézier curves. Basically, OpenType fonts are TrueType fonts with some additional tables, and in case of OTF fonts one special table contains the CFF outlines. CID key fonts were developed to deal with the huge number of glyphs in CJK fonts. For each registry (mostly Adobe), each ordering (for example Japan1 or CNS), and each supplement (a number), there is a defined list of glyph to CID key (some integer). The detailed (and big) lists can be seen here for Adobe-Japan1-6, Adobe-CNS1-6, Adobe-GB1-5, Adobe-Korea1-2. Furthermore, what kind of font is saved into a OTF/CFF font can also vary. There are CID Fonts saved into the OTF/CFF, and non-CID fonts. In the following, when referring to OTF/CFF we will assume it contains actual CID fonts, and not any other font data. For actually accessing glyphs in a CID fonts, one usually applies an encoding to them. The idea is that there is for each encoding a file that maps CID numbers to the right positions (glyph numbers) in the encoding. Encodings can be Unicode, or some local standard, or the CID values itself. and 8.2 states that if the CID Resource is available, the font resource will be auto-constructed. We try to parse out the registry and ordering without actually loading the entire CIDFont (which can be very time consuming), but the code that does that, doesn’t understand OTTO fonts, and probably doesn’t understand CFF fonts either. For OTF/TTF fonts, so those looking like normal ttf fonts and containing quadratic splines, the encoding thing is again done differently. The reason is that in principle Ghostscript is a PostScript interpreter, thus TTF fonts are not really within its realm. Well, that has changed since long, but still. So for TTF fonts, one has to specify an Explicit CIDFont Substitution (again, see Use.html, Section 8.4 by providing some code that loads the TTF font and encodes it properly. Here we were advised not to put the TTF fonts into the Resource/Font directory, because they are not font resources in the PostScript sense. So, how to piece all that together, if you want to make a CID font available to Ghostscript. The procedure varies according to font type. Again, assuming the font file contains a real CID fonts, there are two steps involved: Copying or linking the file into the Ghostscript’s Resource/CIDFont directory under the correct name, and creating pre-made snippets for the necessary font/encoding pairs. Here all CIDFONT and ENCODING need to be replaced by proper values: For CIDFONT there should be a file Resource/CIDFont/CIDFONT, and for ENCODING a file Resource/CMap/ENCODING. There are two steps involved: Creating entries in the file Resource/Init/cidfmap, and creating pre-made snippets for the necessary font/encoding pairs. Note that for TrueType collections (.ttc) you need to select the proper Subfont ID. With this in place, the TTF fonts should be available, too, in the same way as the OTF/CFF fonts. Here the FILENAME.ttf is the link/copy of your font. We realized that vertical typesetting does not work in all cases. In fact, it works only with TrueType fonts, but not with OTF fonts, which is a big disappointment. During a chat session with the Ghostscript developers it turned out, that the problems lies in the fact that the OTF/CID fonts are not completely loaded, so the vertical metrics are not available. There is no quick fix for that, so for now those wanting to have vertical typesetting need to use TrueType fonts. This script can be run several times, in case new fonts are installed into TEXMFLOCAL or font dirs.